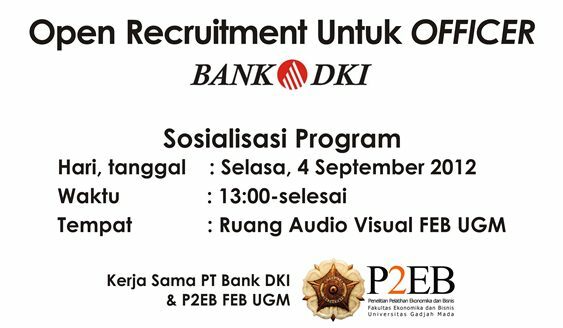 PT Bank DKI is a reputable regional development bank in Indonesia. The bank was established in 1961 and operated as the DKI Jakarta’s Regional Owned Enterprise (BUMD). The Bank currently operated 183 office networks, consists of 1 head office, 5 working unit offices beside head office, 15 branch offices, 32 sub branch offices, 53 cash offices, 40 district cash offices, 31 payment offices, 31 payment point, 4 Samsat drive thru. The Company also supported by 300 units of ATM Networks spreading all over Jakarta and its surrounding areas. The Company also supported by 1,809 dedicated employees servicing various banking products and services for more than one million customers. In Jule 2011, the Bank awarded as the Best in Building and Managing Corporate Image for Regional Government Bank category from from Frontier Consulting and Bloomberg BusinessWeek magazine in the Indonesia’s most Admired Companies (IMAC) Award 2011. Jobelist.com - Powered by wordpress - 14 queries. 1.357 seconds.